…Is the EXCUSE from coaches who’re removing any responsibility to help their smaller hitters hit the ball farther and harder. Tell me one physical advantage that Dustin Pedroia has over most…??! Don’t say eye hand coordination or vision because that’s another common rebuttal. There are countless other MLB hitters with the same superior eye-hand coordination and vision. The reality is, smaller sluggers MUST be MORE effective, in order to compete with sluggers bigger than them. …and weighing in at a soaking wet 165-pounds, we’ll look at Jose Altuve (his height and weight numbers are a little closer to reality I think). Presents of Forward Momentum (FoMo)? Does he practice Pitch Recognition? FYI: the pitch Jose Altuve is hitting in the video analysis looks like an 87-mph FB straight down broadway, and it does look like he’s on-time. Moving Center of Gravity (COG). Down shoulders? (not so much here). My friend Aaron Miles, who was small (5’8″, 180-lbs), and played 9 years in the Bigs, talks about how his High School coach was forward thinking…in that he did Pitch Recognition training with his troops, and Aaron’s coach said he had the best PR on the team. My hypothesis in this Jose Altuve hitting analysis is that he does some sort of PR training, OR has a God given early pitch recognition ability that allows him to hit the ball so hard, so often. …Altuve may not hit over 30 homers per year, but he sure will hit a boat load of doubles, which is just as good to contributing to team wins…just look at his above average (average) ISO and BABIP scores above! Had a practice last week with the travel teams I help coach. A player I had on my summer team, who has now moved up to the 18u team, said that he had been working on his swing since we stopped played at the end of July. He said he wanted to hit like Jose Altuve (wouldn’t we all!). He proceeded to show me how he was modeling his swing after Altuve with a leg lift. I noticed my player was striding into the plate in his stride. I had worked with him on using a parallel stance and a stride straight ahead toward the pitcher. I said that Altuve didn’t stride toward the plate. I was wrong. 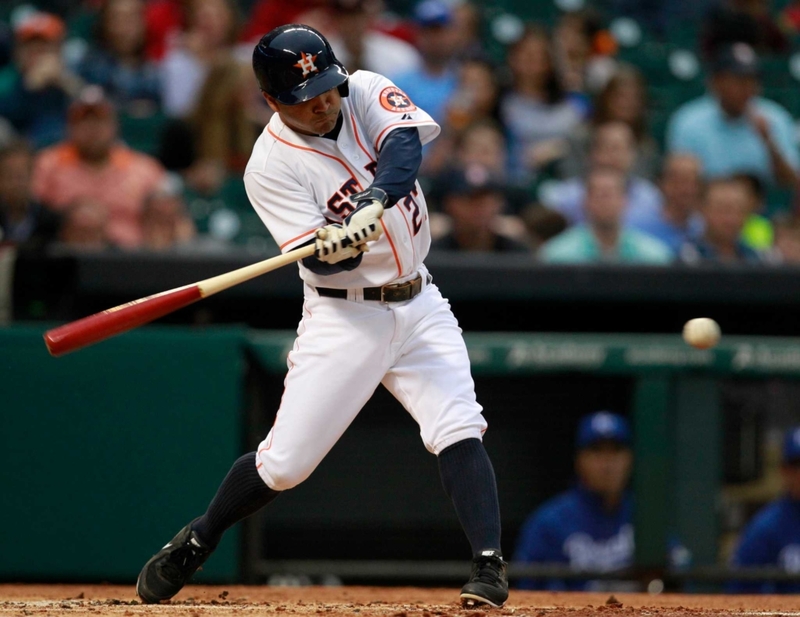 Yes, Altuve does land closed – if pitcher is at 12’o clock, his front toe lands at about 3’o clock. He definitely gets away with this. I don’t find anything wrong with barring the front arm at impact, I just don’t like my hitters doing that at stride landing. Inward rotation of the pelvis (what some call “loading” the hips), landing closed, and too much forward momentum, we’re seeing decreases the ability of the pelvis to clear, which results in lower bat and ball exit speeds, not to mention making a hitter vulnerable to the inside pitch. A gree. Hips should be neutral. Yet despite striding into the plate, Altuve stills hits for power for a guy 5’6″. Just wouldn’t teach it. Striding into the plate is a vestige of the Charley Lau method, which Mike Schmidt and Cal Ripken continued. Is it possible to show your numbers too much? Or have too much spine tilt? At what point do you start to sacrafice plate coverage? Right on Coach B.! Pitch Recognition is something – as I understand – the Houston Astros focused on A LOT this past off and in-season. Makes a big difference when working Perry Husband’s system and the early arm bar. I agree with Perry here on using the early arm bar, ONLY IF Pitch Recognition is worked on feverishly worked on. Without it, early arm barring is ineffective.